As revealed in a survey, the number of Americans, thinking to pay by phones, has decreased in the year 2015, definitely not a good news for Apple Pay. Currently, 43% mobile device users say they would never use the phone payment system, as compared to 44% in year 2014. But those who opted ‘Always’ to use the phone for the payment increased by 2%, i.e. from 4% in year 2014 to 6% in year 2015. 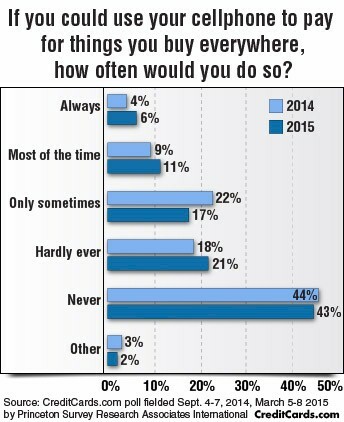 In a polled survey, conducted by CreditCards.com in September 2014, U.S. consumers lacked the warmest to the concept of payment system, using their mobile devices. But, still the good part of the survey report is that the number of mobile device users, willing to pay by their mobile devices for ‘Always’ has increase in year 2015. 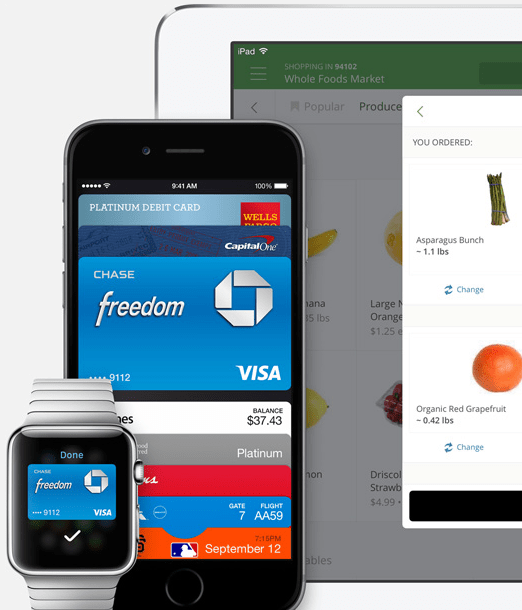 But, it was expected the Apple to gain from the rapid and widespread adoption of mobile payments by Apple Pay which is already occupying the two out of every three dollars spent on contactless payment systems. Contactless payment system do not require the swiping of card through a card reader. If almost 64% American are of the view that they would ‘Never’ or ‘Hardly ever’ use their mobile devices as credit cards even if the chance is there, the Apple looks to be on losing side. What is the root cause of this refusal to adopt the state of the art technology for the payments? Matt Schulz, a senior industry analyst at CreditCards.com is of the view that consumers question not only the convenience but security as well. This is evident from the fact that consumers don’t feel inconvenience by pulling their plastic credit card from their wallet for the payment. The valid concern is shown after the reports by some of the banks marking 6% of transactions by Apple Pay as fraudulent while such fraudulent payments by plastic cards has been approximately 0.1%. Likely Causes of reluctance of the Americans to avoid adopting the contactless payment system has been mainly not on the Apple side as some of the bank have made it too easy to add someone else’s cards into Apple Pay. Further, the lost mobile devices and in the hands of others with loaded credit cards , has been causing a serious damage as any one with hands on the device may use it for the payments. On the other hand, if Apple is successful of capturing the one-third of the American market, i.e. 100+ million users (open to the contactless payment system), with the sale of the iPhone, then situation may become different. With expected shipment of the 52 million units of smartphone in the quarter ending on March 31, Apple Pay may change the scenario. Further, as reported by CreditCards.com, the greying America also looks to be helping the Apple. Within the last six months, the Americans, reaching 65 or plus age, who previously said they would never use the cellphones, have fallen from 64% to 52%. Though the mobile payments has been just 2% of total U.S. $3.2 trillion sale, this 2% is $64 billion and is so impressive that Apple must show concern. Major tools in the hands of Apple are; Apple Watch and iPhone 6 Plus. Newer How to Add New Accounts in Mail App for Windows 8.1 & Windows 10?